The road in front of North-Eastern gate of government Secretariate in Trivandrum is known as Poonen Road .It was named after Dr.T.E.Poonen, the first MBBS holder of Kerala .He took MBBS from Aberdeen University in UK in . He was the Royal Physician of Travancore. He was born in Aymanaom. Madras Governer Dr.PV.Cheriyan , the famous ENT Surgeon, was his relative. Bukkar Prize winner Arundhathi Roy (God of Small Thins) belongs to his family. Mary Poonen Lukose was born on 2nd August 1886 as his daughter.She wa sthe first and only female student of Maharaja's (Now University ) College.She became the first BA holder lady of Madras University in 1909. Even though she wanted to become a Doctor like his father, at that time it was impossible for a lady to get admission in Medical College. So she went to London. She was the first Indian student that too an Arts graduate to join London University for MBBS. She passed the London Music Examination at the age of 18. She had Post Graduate study in Obstetrics & Gynecology in Rotunda Hospital,Dublin and training in Paediatrics from Children's Hospital,Ormound Street, London.Meanwhile Dr.Poonen died. Mary went to UK like a queen but eturned as an orphan.In 1916 she was posted as the Obstetrician of W&C Hospital,Thaikadu. The First Indian to get that post.She continued there till 1917. She was married to K.K.Lukose (Head Sarkkar Vakil)Bar at Law who later became Judge of High Court.She was the only Doctor in W&C and she had to do Caesarian section during night with hurricane lamp. "Missiamma" was doing more than 1000 Caesarians per year.She was the Chief of Medical Service from 1916 at the young age of 30. She became Surgeon General in 1924. The First Surgeon Genral of the entire World. She established the TB Sanitorum in Nagercoil. She was given the tittle of Vaidyasasthrakusala by Chithira Thirunal. She was President of YWCA for 50 years. 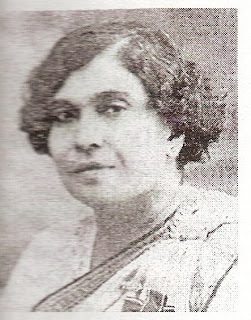 She was the Chief Commissioner of the Guide Movement in India. She had to face the death of her both children K.P.Lukose, Ambassador to Bulgaria and Dr.Gracie Poonen Lukose FRCS,Surgeon and her husband before her death on 2nd Oct 1976.